Lithuanian cepelinai or zeppelin dumplings are hearty, football-shaped dumplings made with grated raw potatoes and riced boiled potatoes. They are made in either a curd cheese variety (like farmer's cheese) served with a sour cream-milk sauce, or a meat variety (ground pork or a ground pork-ground veal mixture), and served with a sour cream-bacon-onion sauce. Here, Lina Ceplinskiene, a cook for Grand Duke's Restaurant in Summit, Ill., shows how she has made Lithuanian meat Cepelinai all her life. She is using a special processor common in Lithuania, but you can use a typical food processor. As the main ingredient is potatoes, you will need large peeled raw Idaho potatoes. The first step is to grate the potatoes. Fit your food processor with the smallest hole grating disc. Cut the potatoes so they will fit into the food chute of your food processor. Feed the quartered pieces of potato through the food chute to be grated. The raw potatoes are grated very finely so they form a smooth purée. It is important that all of the liquid be removed from the potatoes. Place the potato pulp in a muslin cloth or cheesecloth and wring it dry over a bowl to catch the water and potato starch (which you will use). Carefully dispose of the water from the potatoes which collected when they were wrung dry. Make sure to leave the potato starch sediment at the bottom of the bowl. Remove the squeeze-dried potatoes from the cloth and transfer to a bowl with the reserved potato starch. Next, you will need to boil potatoes for ricing. After they are cooked, push through a ricer. Then grate some onion. Add the riced potatoes and grated onion to the mixing bowl and combine. Make sure you have all of your ingredients ready before you begin to form the meat cepelinai. 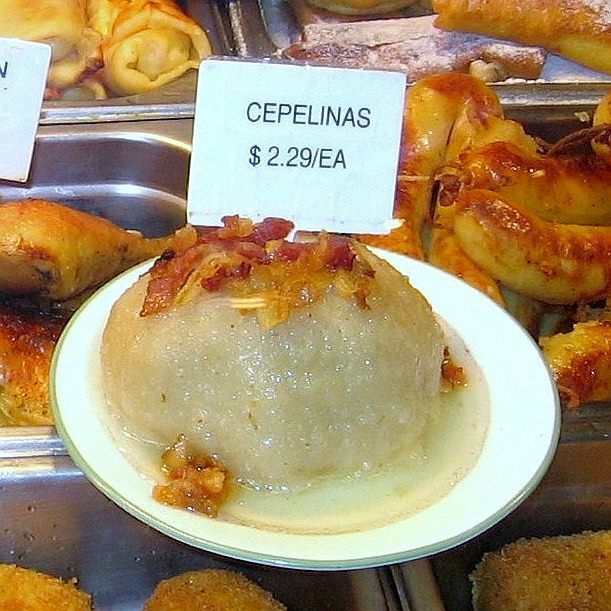 Lina uses an all-pork filling for her meat cepelinai, but a combination of pork, beef, and veal also can be used. Take about 1 cup of potato mixture and flatten it into a patty in the palm of your hand. Take a generous portion of pork filling and place it in the center of the flattened potato patty. Using slightly dampened hands, encase the meat in the potato mixture, making sure it is sealed well. Line up the shaped cepelinai until they have all been formed before starting to boil them. Adding cornstarch to the boiling water will assure the dumplings won't fall apart when boiling. Lower the dumplings carefully into the water and let the meat dumplings cook for 25 minutes. 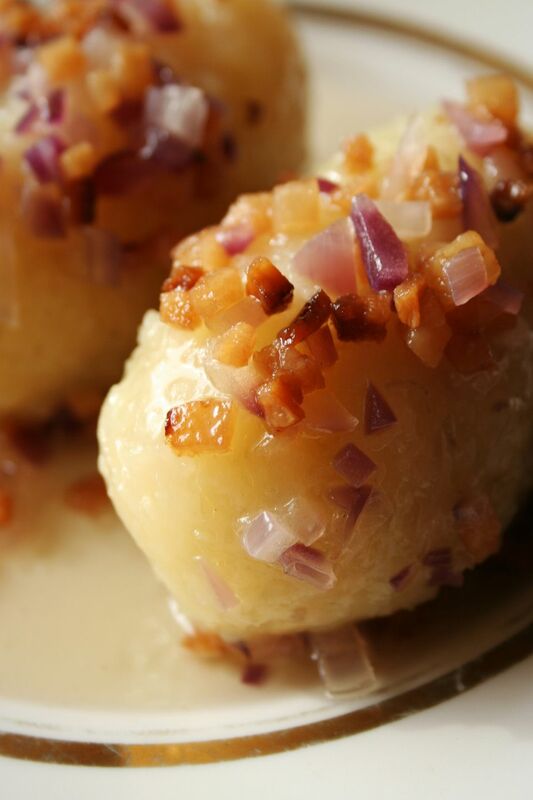 Meat cepelinai are served with a sour cream-bacon-onion sauce.